Aiyillia Pooja To propishiate the Nagas to ward off evil effects of bad Karmas. Bhagawal Seva For well being and escape from all dangers. Chuttu Vilakku For the good of the world and for the well being of the offerer. Ganapathi Homam To ward away obstacles(Vignam) and for the overall prosperity. Karuga Homam To remove Balarishtams. 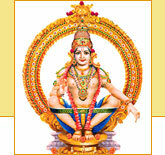 Mrithyunjaya Homam For good health and longevity. Neeranjanam To ward off the evil effects of the “Grahas”. Ney Abhishegam For contentment of the soul. Most important offering for Lord Ayyappa. Pushpabhishekam For the welfare of all creations of the Lord and the nature etc. Swayamvara Archana To remove hurdles in marriage. Thulabharam The devotee places himself and his belongings at the feet of the Lord. Thrikala Pooja For the good of the world and the brightness of the body and mind of the devotees who is offering it. Usha Pooja Cools the brain and directs it for doing good things. Udayasthamana Pooja The most important pooja performed in the temple. It gives “Sarva bheesta Sidhi” viz., fulfillment of all wishes, health, wealth, long life, mental peace, happiness and harmony in the family.